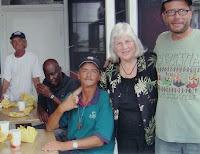 Roman Catholic Womanpriest Judy Lee: Ministry to the Homeless- "Jim Died Tonight"
Jim died tonight. He was 49 years old. I am attaching a picture of us from last July. It is a picture I will send his family. He is the one seated holding my hand.I brought him into Lee Memorial on Friday night from the ministry. His pancreas and liver were shot and he was in much pain as his belly looked like a 12 month pregnancy. He had lain in the woods for two weeks in this awful state but I only learned of it on Wednesday. Finally someone directed us to him on Thursday night. I sent the Salvation Army Nurse there on Friday afternoon but he refused her help. I had her tell him to come to the ministry or I would come get him on Friday night. His best friend put him on the bus from NFM and there he was-so frightened and in such pain. I talked with him until he had the courage to go with me. One of the volunteers drove us up the street and his friend and I somehow got all immobilized 6 feet of him in there. He would not let me leave his side so I went through the exams with him. When they finally sat him in a recliner he said "this IS better, and this is my Pastor, and I love her.I told him that I loved him too and that he was God's beloved son". "I know" he said and the Nurses were crying and so was I. He was finally admitted after many hours in the ER I visited him on Saturday after church and he was agitated( I think also detoxing with tremors) but so happy to see us. We talked about his parents and children in another state. I took his parent's number but he doubted that they would call him. We talked about forgiving and being forgiven. He conveyed his love for them, and I will tell his parents that when I call them tomorrow.How I wish that I had remembered to call them on what was a hectic Sunday. At the end of the visit I anointed him with oil of Chrism and prayed with him. He put his arms around me and thanked me for loving him. He did the same with JudyB. I thanked him for loving us. We had talked about his possible discharge( to SA Med Unit or or Joshua House) and he wanted to make sure we would bring him clean clothes on Monday! I asked my 'elders' to visit him on Sunday but do not know if they did. Well, we spent today settling Brenda into her new home in Port Charlotte and got there about 6PM. We learned that he had recently been taken to ICU. When we got there we were shocked to learn that he had just died. They let us stay with him and I said the final prayers. This was a time of peace and grace. He is free of all the tortures he has faced. And tomorrow I will make final plans with the family and do some sort of a funeral/Memorial Service here soon. But, I can not tell you what this has done to me. I feel like I am running to meet urgent needs like this and can't run fast enough. There is a renewed sense of urgency about this ministry,and the prayer to have more hands to do it. I guess that is the prayer for church to do its work before we lose another one. This is the second one in a year. The first was Tammy who was hit by a car crossing 41. Please keep us in your prayers.